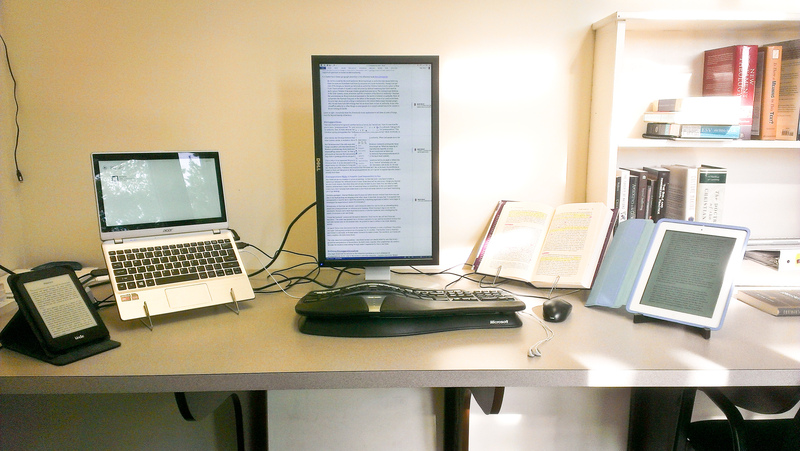 My new favorite way to write: a widescreen tipped up vertically. In the 1990s, this monitor direction was typical for secretaries: it enabled them to view a page of text. Hardly anyone else purchased such a monitor. I expect that they were fairly expensive. B&W only, as I recall. The 1990s… I’ve heard of those. But this is actually a pretty standard, wide-screen, Dell monitor—1920×1080. It just happens to have a bracket which allows it to be flipped. I just love it. New desk location? Looks different than I remember your old desk being.